“Bishop Harrington, fellow priests, people of Donagheady, and visitors from far and near, I am very happy to be here today to share with Kevin and the whole Conway family and friends what is a memorable event in the life of this parish. 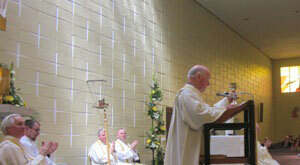 Our picture is of Fr Doherty showing the Chalice to the congregation. I personally have celebrated many joyful events in this church for over 20 years, but today’s surely exceeds them all. And I now want to assure Kevin that he will be in our prayers not just today but down the years… that he will be happy in his priesthood, that he will grow and reap a rich harvest in the foreign missions where he has chosen to work in God’s vineyard. Fr Kevin will know that he is walking in the footsteps of other men who have gone before him: Fr Michael McGlinchey, Fr Paddy Dooher, Fr Noel McDermott, Fr Stephen Kearney, Fr Barney Blee, Fr Tommy Blee. Kevin has tipped the balance in favour of the missions. I now want to tell you today about Fr Hugh Conway. He was born in Altishane townland in 1889… one hundred and twenty-two years ago. He was sent to study for the priesthood in Salamanca, Spain. He was ordained in 1918 and ministered in the diocese until 1977, aged 88 years. His first appointment was to Edinburgh, where he ministered for eight years. Before returning to the Derry diocese, some parishioners wanted to express their appreciation for his dedicated service to the people of the parish. And they chose to do so by presenting him with a gold chalice. Fr Conway chose to bequeath that Chalice to me at his death, thirty-three years ago, a gesture that I appreciated very much. 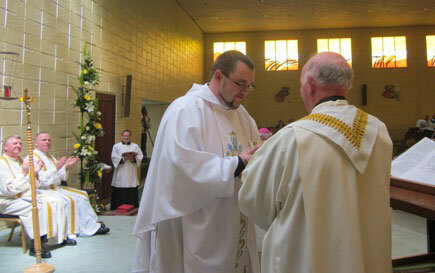 It gives me great pleasure on this great day to pass on this same chalice to a new Fr Conway. At the presentation of the Chalice by Fr Doherty to Fr Kevin the congregation broke into sustained applause. It was as all were raising a prayer to God that the new Fr Conway will be as faithful a priest as Fr Hugh Conway who has gone before him marked with the sign of faith.